The Risingville Intercommunity Service Effort (RISE) repairs homes for those whose living conditions are unsatisfactory and who cannot help themselves, due to physical and/or economic inability. 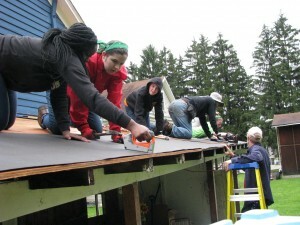 The program is affiliated with the United Methodist Church and takes place in the southern tier of the Appalachian Mountains in New York State, using volunteer labor of church high school youth and adult groups. Work teams are comprised of 4-6 high school youth and 2 adults. Teams fund raise throughout the year to be able to provide for their transportation to and from the worksite, building materials, and meals. During the RISE week, the teams are housed in centers, usually schools or churches, sleeping on floors, showering in nearby facilities (campgrounds, YMCA…) and learning to live, work, and share in community. Each summer for over 35 years, CUMC youth teams are involved in a RISE Mission trip to Steuben County, New York where they help repair homes for a week. To learn more about their experiences, see the videos below. If you’re interested in joining CUMC’s team, contact Karen. 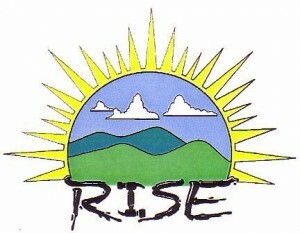 If you are looking for information on how your youth group can get involved in RISE, click here.